Stay informed, get involved – check out our Blog and Upcoming Events. Read the proposed South Hadley Town Meeting Resolution. 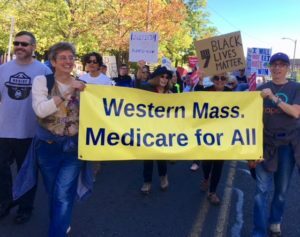 View our slideshow that explains the Medicare for All bill in Mass. Watch our short video, the first in an online series! Western Mass. Medicare for All (WMM4A), launched in May 2017, is a regional network of groups and individuals advocating for a Single Payer health care system in our state and country. Please join us as we build a strong grassroots movement to advance health care as a human right and to move single-payer legislation forward in the Commonwealth. WMM4A coordinates activity among individuals and groups called “hubs” in Franklin, Hampshire, Hampden, and Berkshire Counties. We provide organizing support and resources, and help connect newcomers with hubs in their local area. Check out our blog for updates. In addition to this website, WMM4A hosts a Facebook page and a listserv keeping subscribers informed about Medicare-for-All events and meetings. Our lively monthly meetings bring together Medicare-for-All advocates for updates, resource-sharing, discussion and action. WMM4A is a member of the statewide Mass-Care coalition. Mass-Care’s current goals, partly based on the Western Mass. model, include building hubs in all 160 Mass. State Representative districts, expanding the coalition, and coordinating Statehouse efforts with the new Medicare for All Legislative Caucus. New folks are always welcome at WMM4A. Please join us in this exciting campaign for social and economic justice! Contact us to discuss other ways to get involved!